L'Empire de la Chine d'Apres L'Atlas Chinois avec Les Isles du Japon. A beautiful example of Rigobert Bonne's c. 1770 decorative map of China, Korea (Corea), Japan and Formosa (Taiwan). Extends from Tibet and Chinese Tartary east to Japan and south to Hainan. 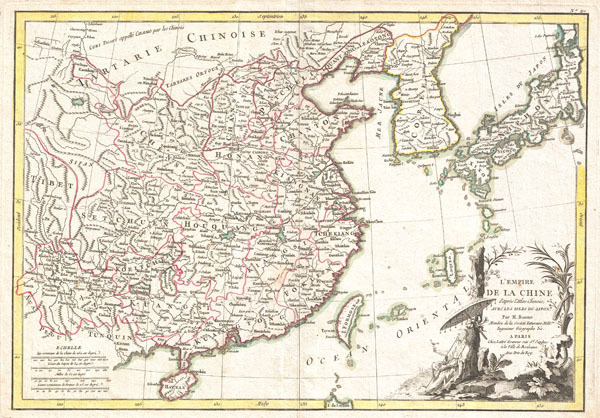 China is divided into various provinces with major cities, lakes, and riverways notes. Names Macao, Canton, Nanking (Nanjing), Jedo (Tokyo), Peking (Beijing) and countless other cities. The lower right quadrant is decorated with an elaborate title cartouche showing an Chinese scholar or monk relaxing with a bird in a forest under a parasol. Drawn by R. Bonne c. 1770 for issue as plate no. 35 in Jean Lattre's 1776 issue of the Atlas Moderne. Very good condition. Original centerfold exhibits minor toning. Blank on verso. Rumsey 2612.058. Phillips (Atlases) 664. National Maritime Museum, 215.